Postcard with a drawing of the Greenway Court Manor House which was demolished in 1834. 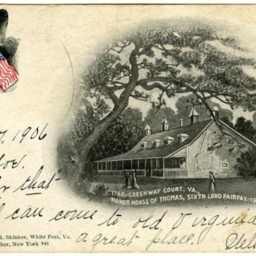 The card includes a description of the site, its history, and the Fairfax connection. 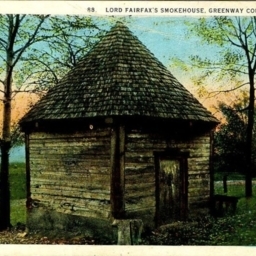 Color postcard with a picture of Lord Fairfax's smokehouse located at the Greenway Court Manor near White Post Virginia. Greenway Court Chapel, Near Millwood Virginia. 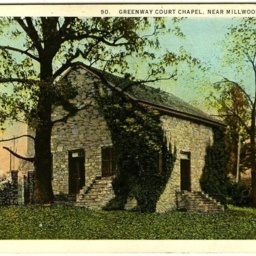 Color postcard with a picture of the Chapel at Greenway Court near White Post Virginia. 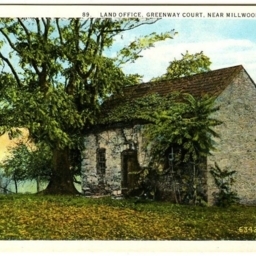 Color postcard with a picture of the Land Office at Greenway Court near White Post Virginia.